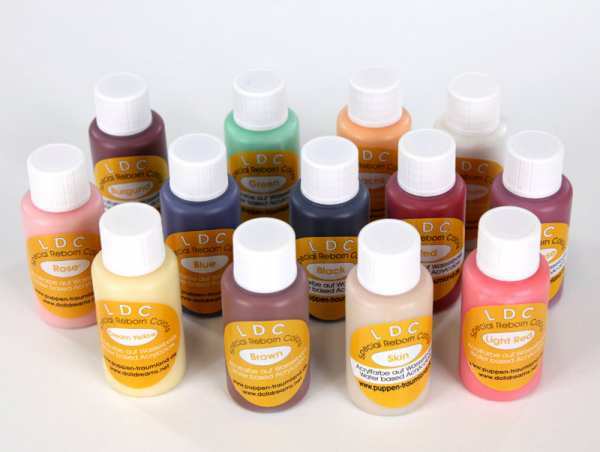 Product information "LDC® Special Reborn Colors Little Set"
LDC® (Little Dreams Collection) Spezial Reborn Colors ist eine hochwertige auf Wasser basierende Acrylfarbe. Sie ist speziell für Vinylpuppen entwickelt worden. Ob komplette Färbung oder Akzentsetzung. Ideal auch für die Real-Skin-Technik. Sie wird mit einem Schwämmchen oder einem Pinsel ganz dünn aufgetupft und ist sehr schnell trocken, so dass die nächste Schicht kurze Zeit später schon aufgetragen werden kann. Die Farbe trocknet matt. The set is available in 30ml vials or 10ml. Make sure at the coloring that the colors will enough reduce, otherwise don't move into the vinyl. The mixing ratio is 1:10 (1 paint drops, 10 drops of water). Idela for metering is a pipette. If there are several colors, you must correspondingly increase the water drops. Our colors need no further additives (no sealing or the like). They are thoroughly dried after about 24 hours and then fade and smudge-proof. If you can be wiped off after 24 hours, the color mixture contained too little water. Because the color is too thick, it lies on top and can not move into the vinyl. Related links to "LDC® Special Reborn Colors Little Set"
Customer evaluation for "LDC® Special Reborn Colors Little Set"